I deemed my experiment in Part #1 a success, but it had a huge drawback in not keeping any state, it was only refreshing fresh data all the time. It also would not scale for multi user, because the fetching would be too heavy for many users to be monitoring simultaneously. Thus I had a new goal, separate the metric retrieving from the metric displaying. The plan is to collect metrics using Salt and its Returner component. Returners makes the salt published commands return data using a different route than back to the publisher (master). But first I had to choose a backend. Cube has a mongodb + node stack. Graphite is built using python components whisper, carbon, and graphite-web. Whisper is a RRD-alike format, Carbon is a network daemon and collector backend for whisper, and graphite-web is written in django. Since I'm a fan of both python and django I decided to go with the graphite stack. I wrote a simple graphite state to install the graphite server. Two parts is not covered in the state, the configuration files and service starting. I used all defaults everywhere. Carbon supports two protocols and pickle, I struggled abit with getting pickle to work, so for testing I am using the text line protocol. That also enabled me to debug easier. I'm also happy to say that my carbon returner got merged into saltstack upstream, so it can be used and improved by everyone that's interested. The carbon returner has a weak point in its design, it only supports one type of data, dicts within dicts, since that was all I had to support to get my virt module metrics into carbon. One thing it could be easily extended to do is parse output from all the existing munin plugins, or collected plugins. But lets not get ahead of ourselves, lets see if the runner works. This runner just publishes the commands to be run in an async fashion. No data is returned to the master. I use a simple list to specify my virt hosts. et voilà! metrics are now persisted by the graphite stack. And I can now return to my client and rewrite cubism client to use graphite backend. The graphite queries include wildcard support, so I could easily get graphs for rxbytes, txbytes, disk_counters and cputime using one simple function. If I want multicolored graphs per host I would have to make some changes. 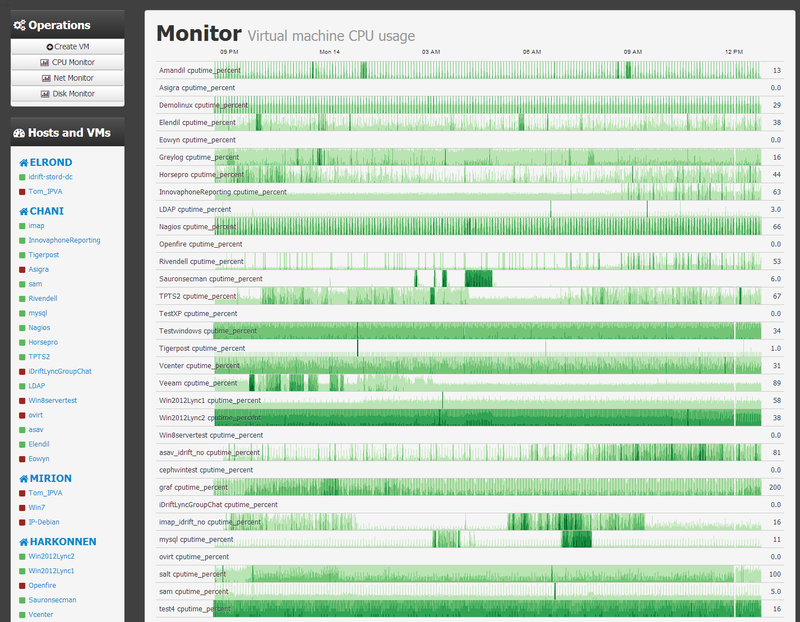 And now I have persistent metrics with a very simple way to visualize them in my VM monitor web front end.